Subject: LongIsland.com - Your Name sent you Event details of "Taiko Drumming and Dance Troupe"
"One of the top-ranking taiko groups in Japan will perform thundering taiko drum rhythms accompanied by traditional Japanese dance, with nearly 30 drummers and dancers taking the stage. 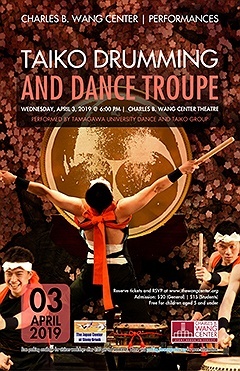 Tamagawa University Dance and Taiko Group has gone on tours around the world since 1961, visiting Mexico, England, Greece, Canada, Malaysia, Russia, Indonesia, Africa, and the United States. This is their third visit to the Charles B. Wang Center as part of their Annual East Coast Tour. The Tamagawa University Dance and Taiko Group recently won third place in a competition against 450 other groups at the Tokyo International Taiko contest. "